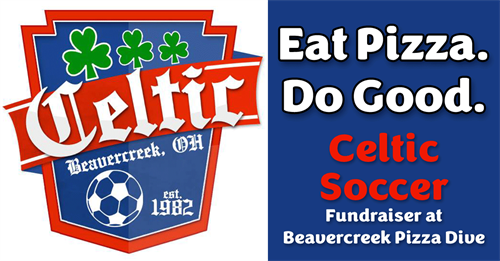 Beavercreek Celtic Soccer Fundraiser February 11 – 14 at Beavercreek Pizza Dive. Show your support for Beavercreek Celtic Soccer Girls 11U White and help them raise some dough when you eat pizza February 11 – 14 at Beavercreek Pizza Dive. Come to the Fundraiser Kick-Off at the All-You-Can-Eat Buffet on Monday, February 11 from 4:30 to 8:00. Beavercreek Celtic Girls 11U White parent volunteers will be your celebrity servers at the Fundraiser Kick-Off. $1 from every Adult Buffet purchase goes to the fundraiser when you bring the flyer. Eat pizza Tuesday, February 12 – Thursday, February 14 and 20% of your purchase goes to the fundraiser when you bring the flyer. Come out, come hungry, come eat some pizza, and come raise some dough for Beavercreek Celtic Soccer Girls 11U White.